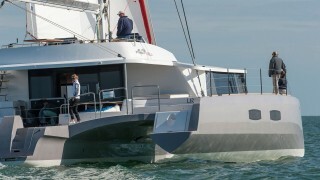 DNA are retained: safety, easy centralized maneuvering, steering fineness, central technical room for centered weight, which brings a comfort and sea-keeping unequaled, performance (fast in standard version, even more powerful with optional carbon mast, textile standing rigging and hydrodynamic sails), single-level living, owner suite on main deck with panoramic view. 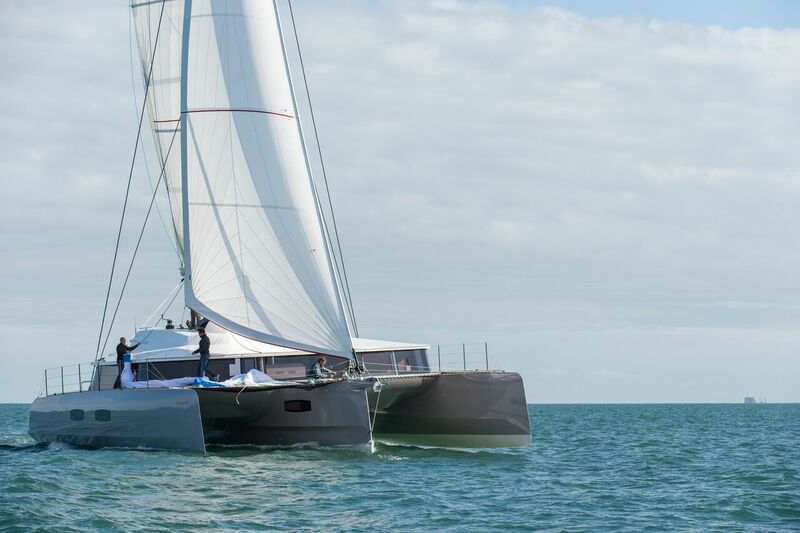 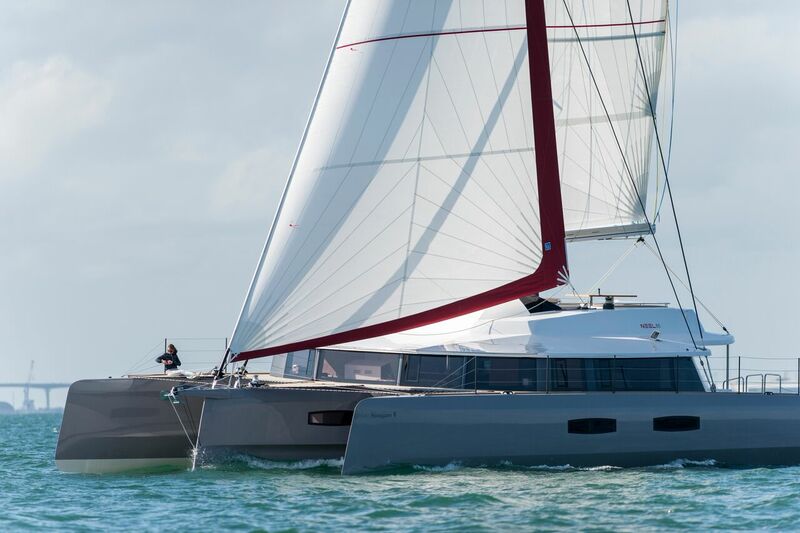 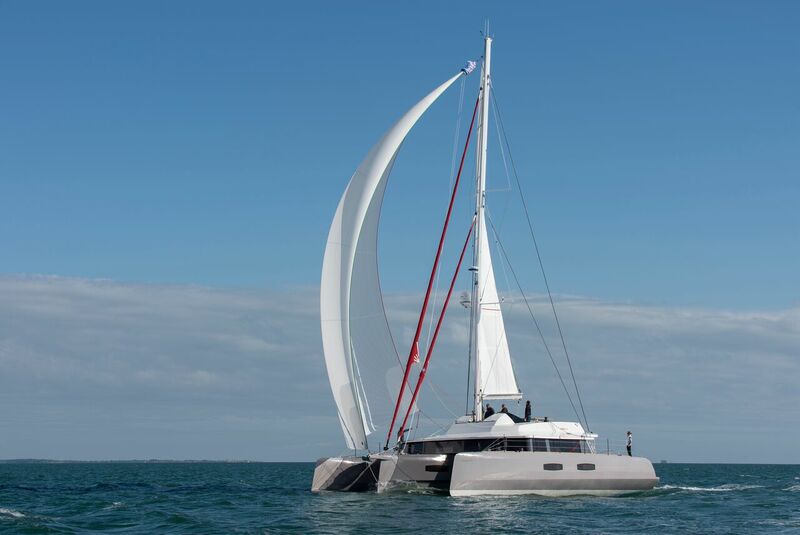 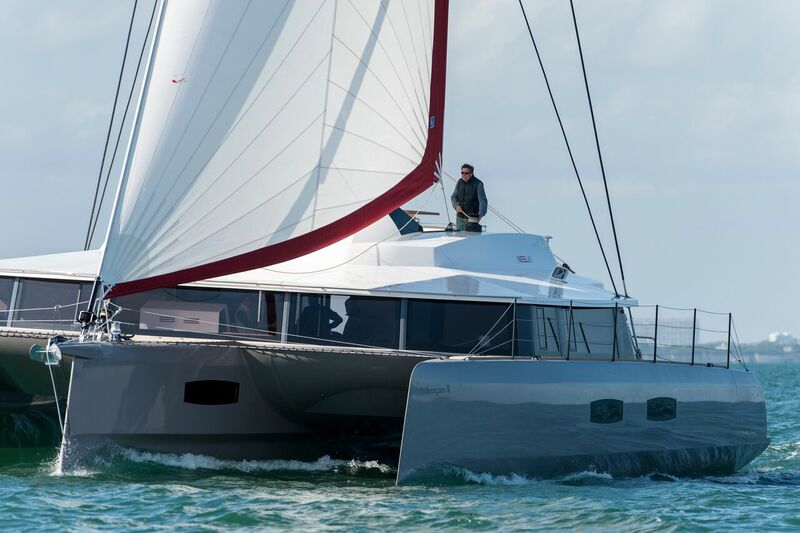 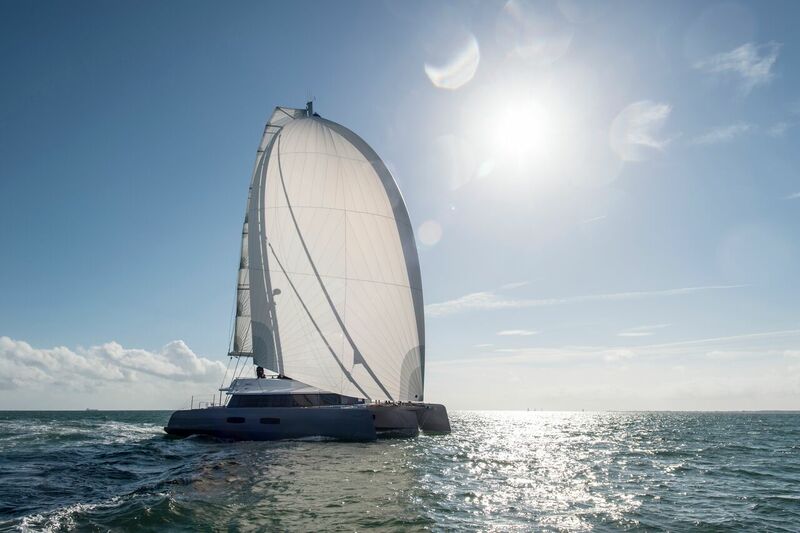 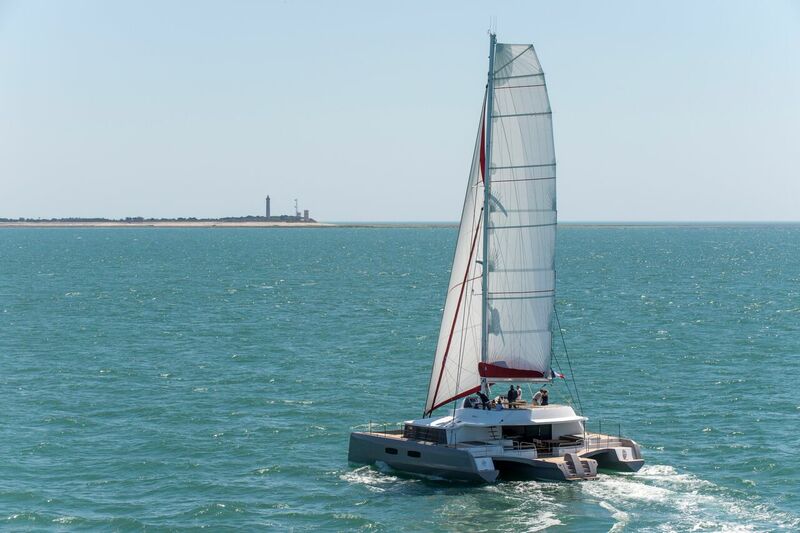 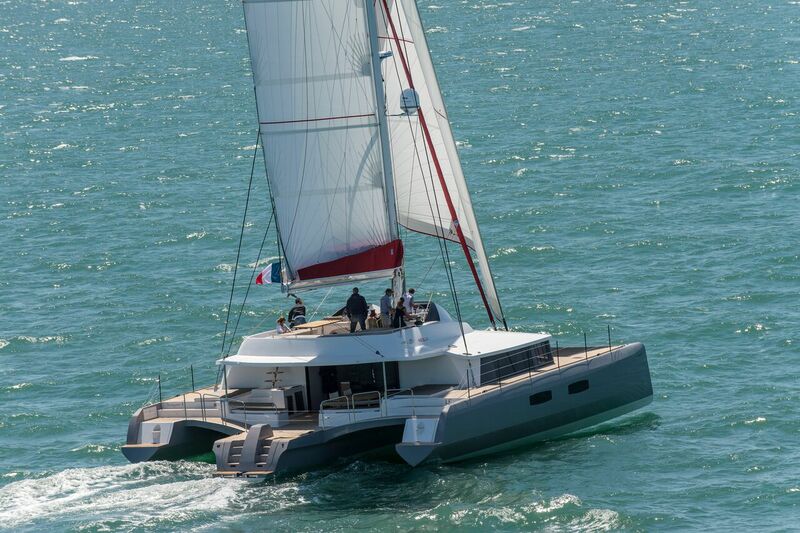 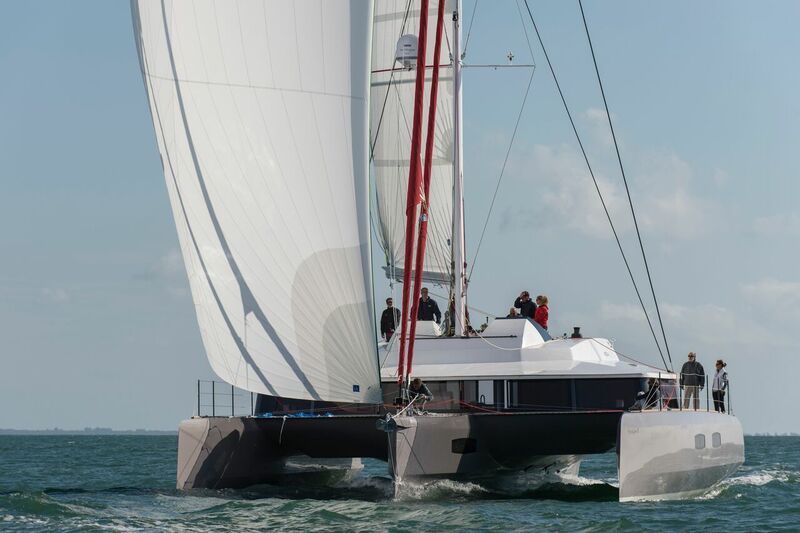 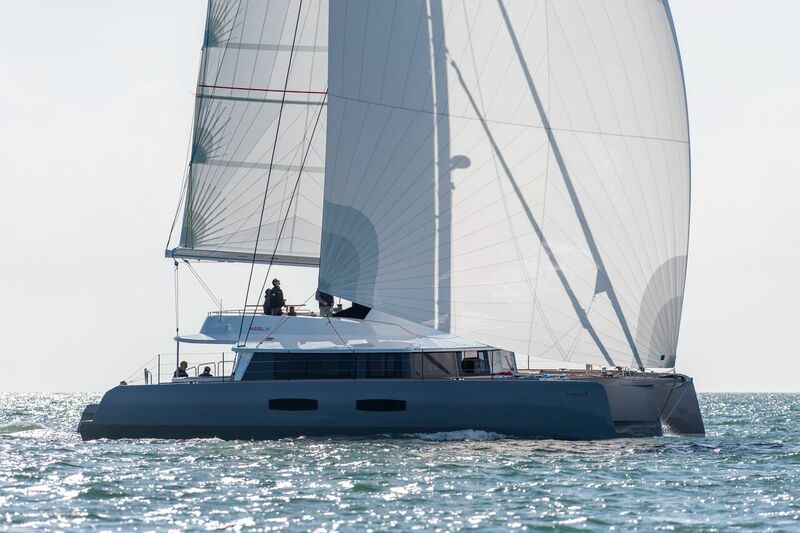 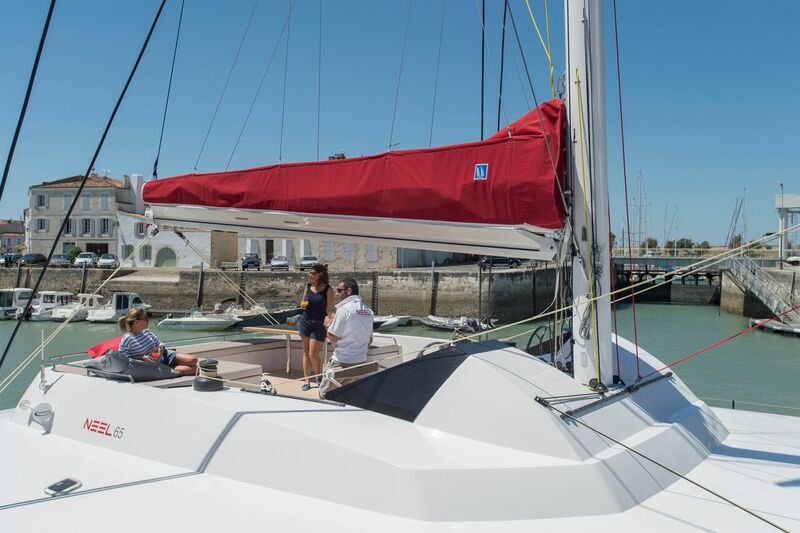 The NEEL 65 is a lightweight craft with sleek lines and all the sailing qualities of its smaller brother the NEEL 45, including outstanding performance, responsive handling and excellent comfort while underway. 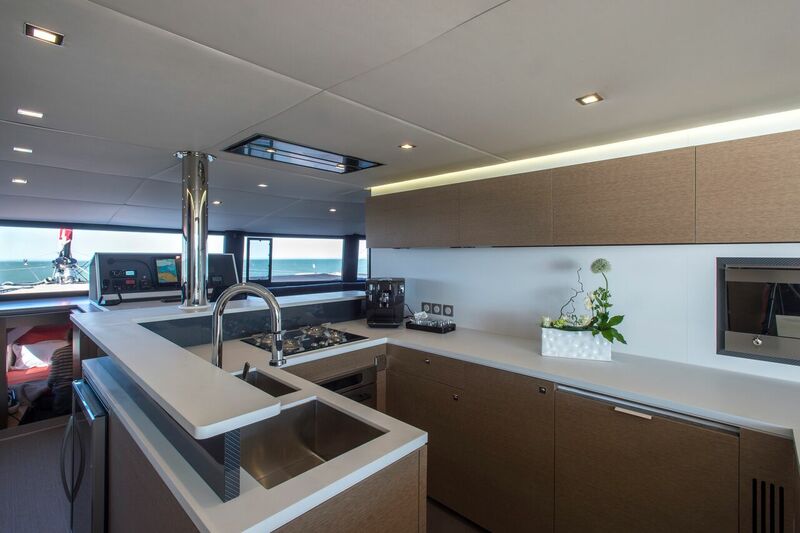 The interior is the impressive work of Franck Darnet Design, combining a contemporary feel with sophisticated and refined materials, resulting in a ‘sporty chic’ aesthetic. 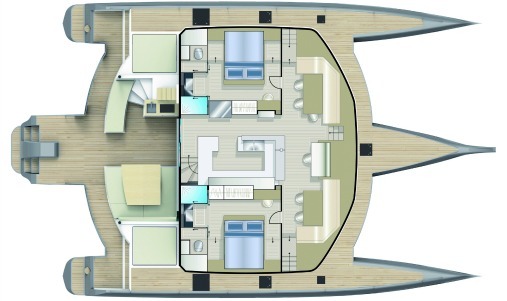 The elegant saloon cabin offers a wide panoramic view. 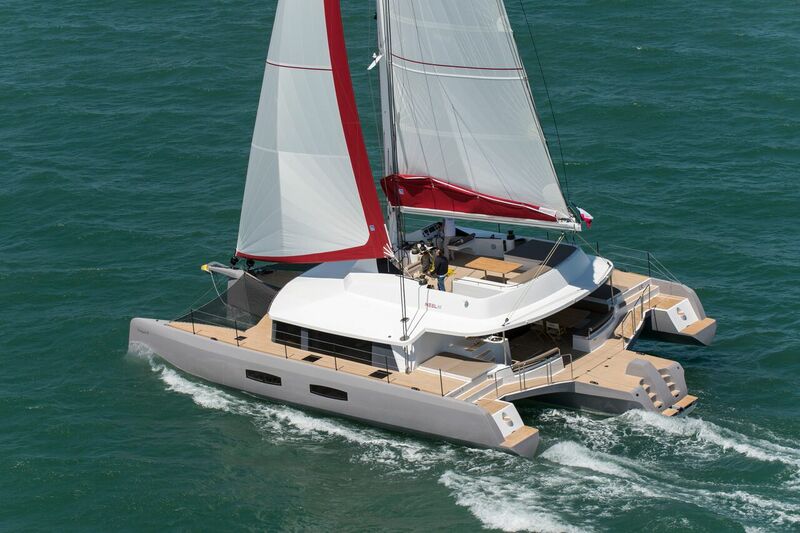 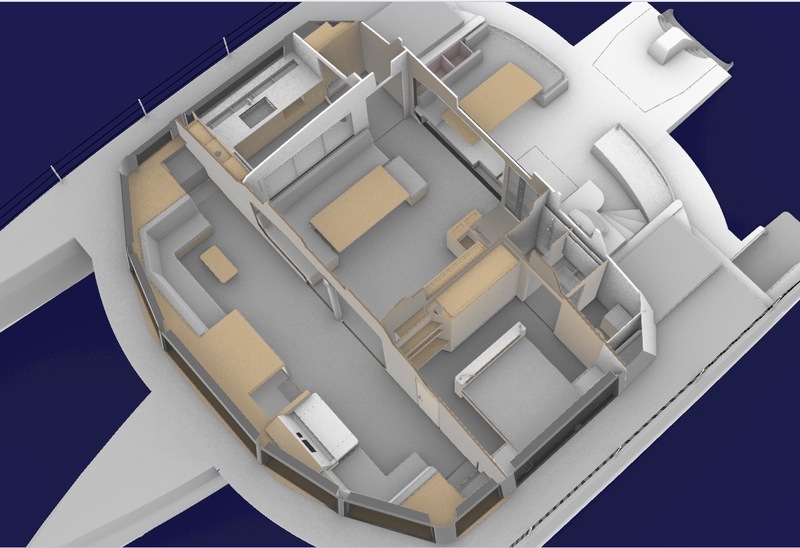 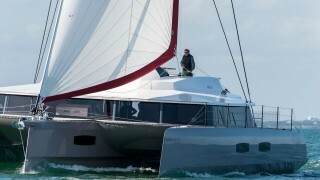 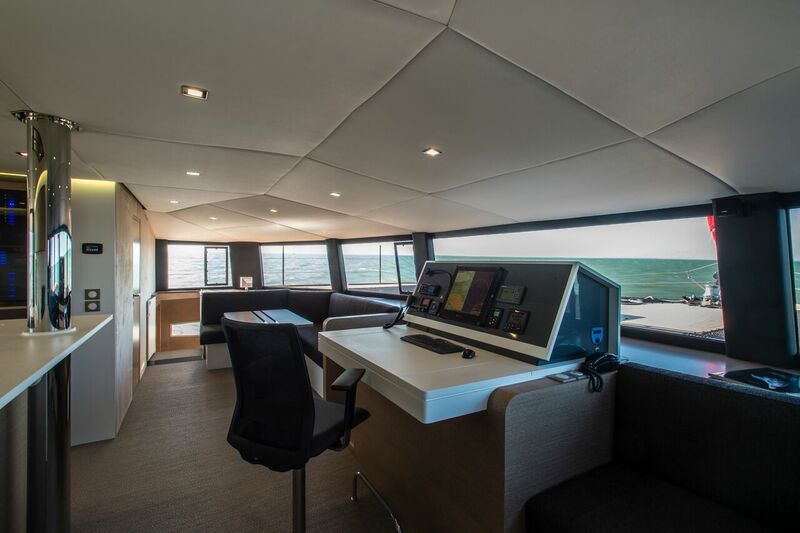 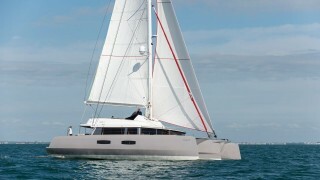 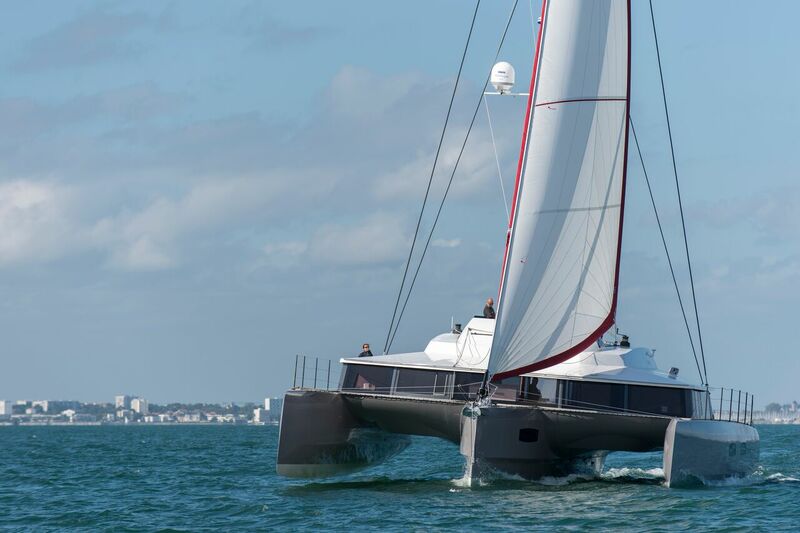 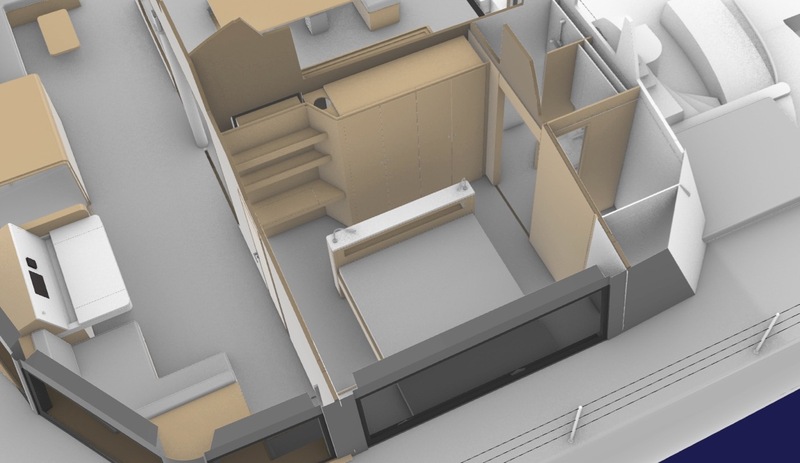 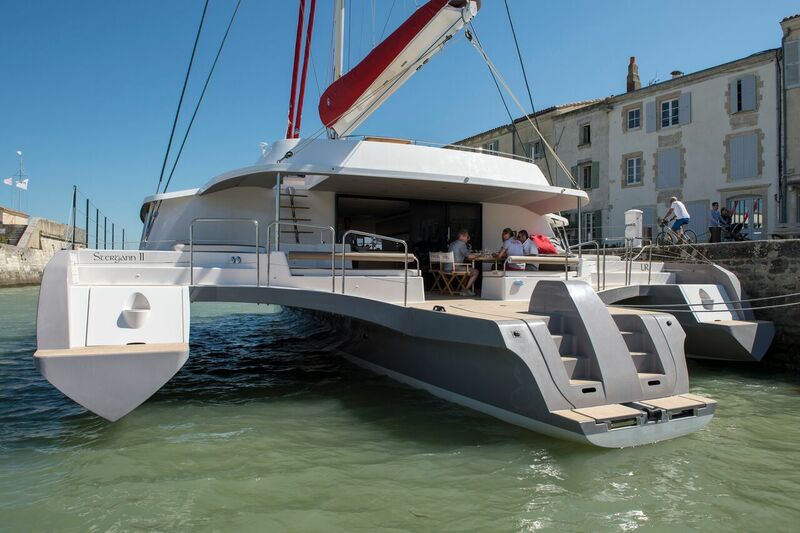 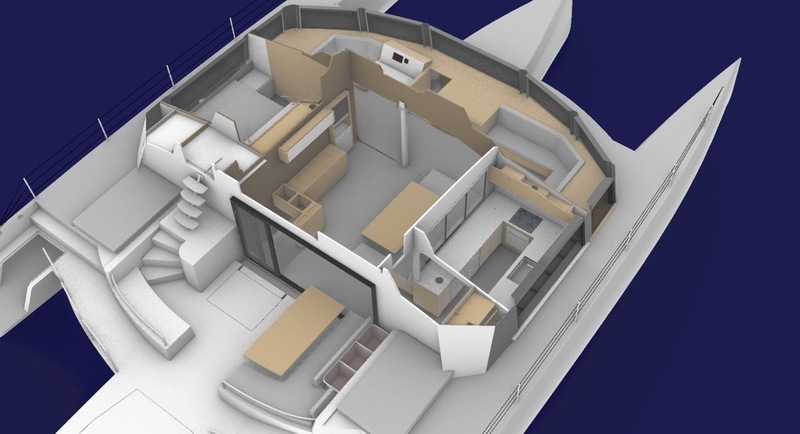 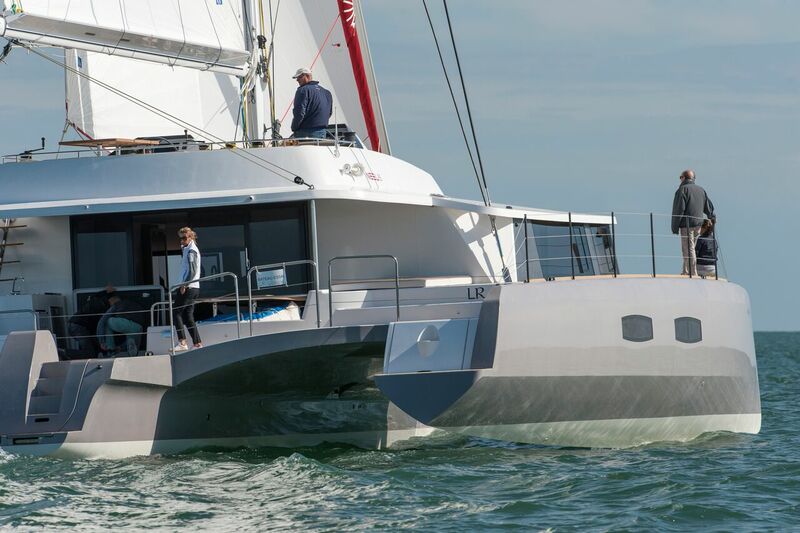 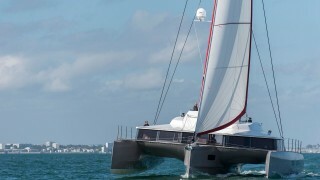 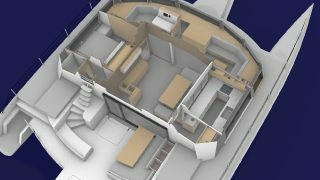 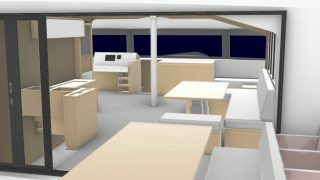 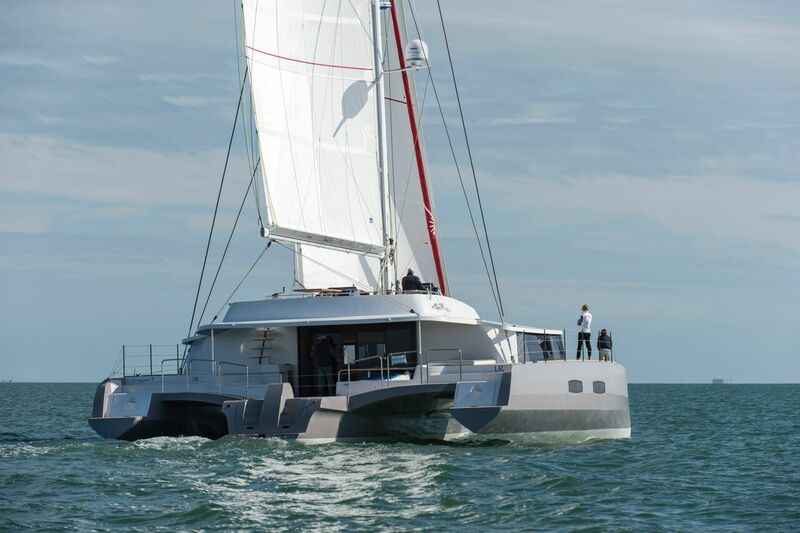 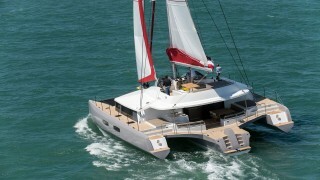 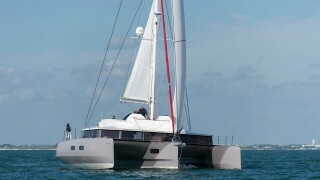 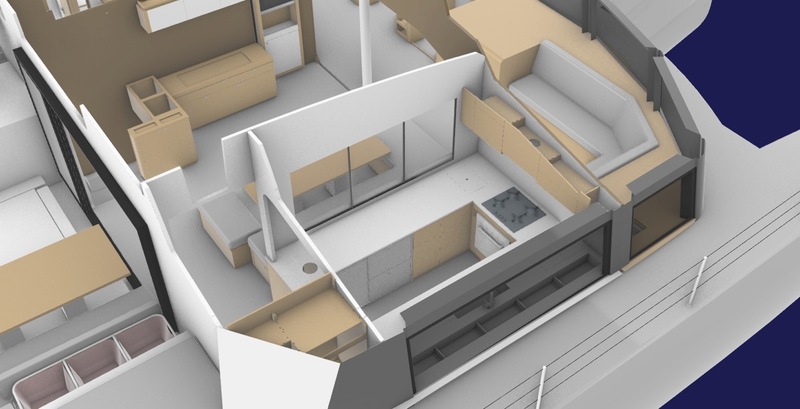 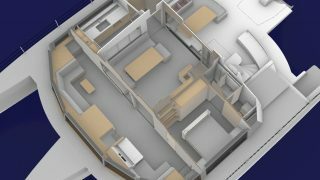 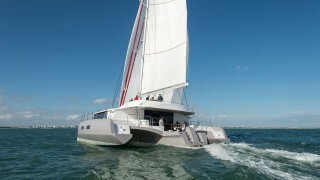 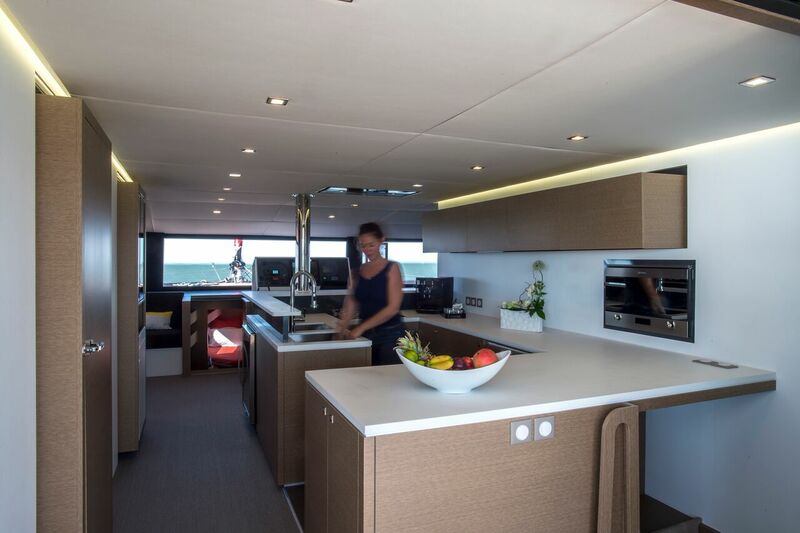 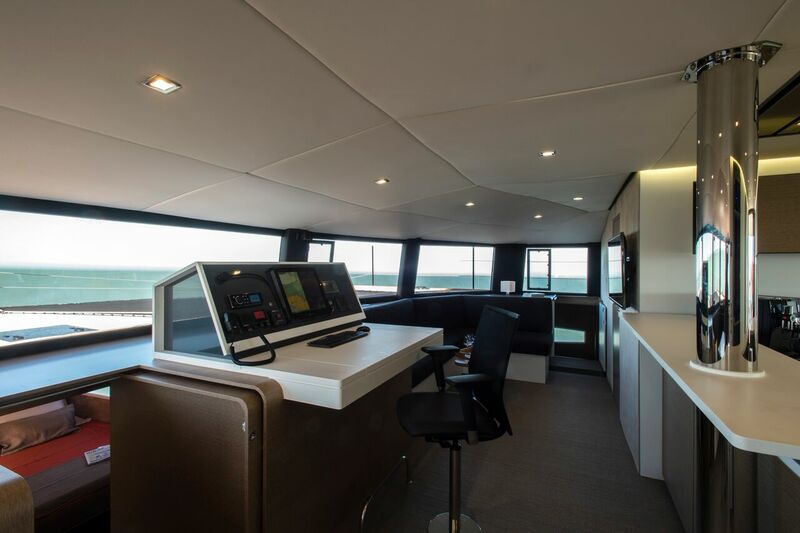 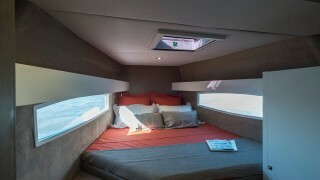 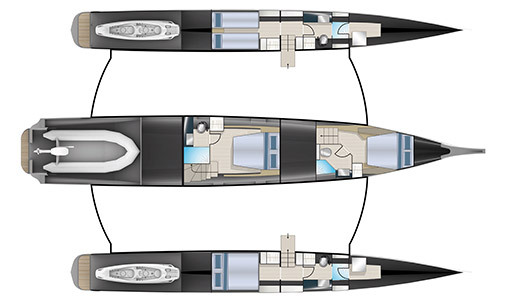 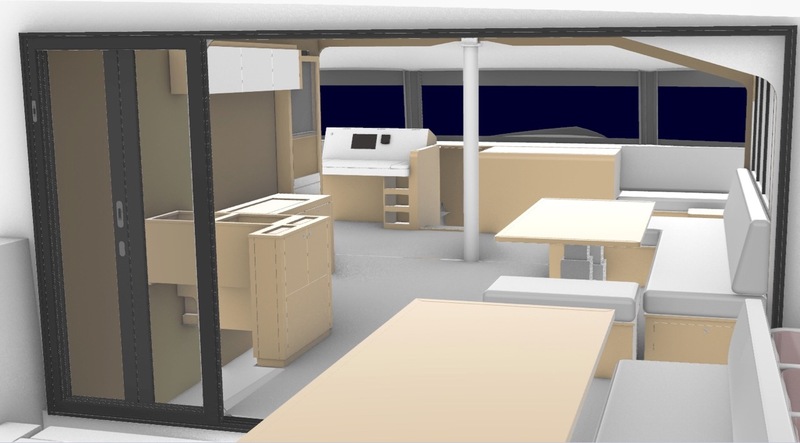 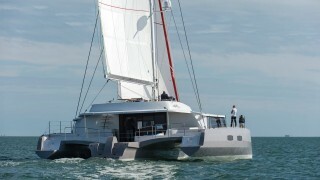 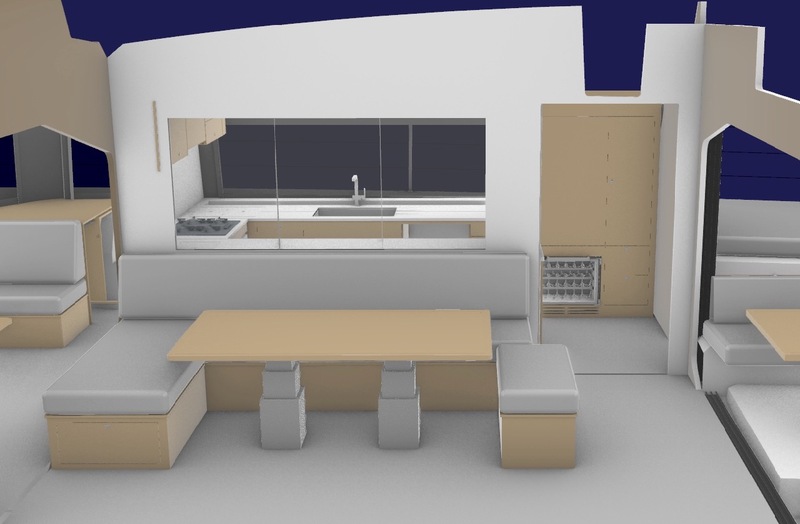 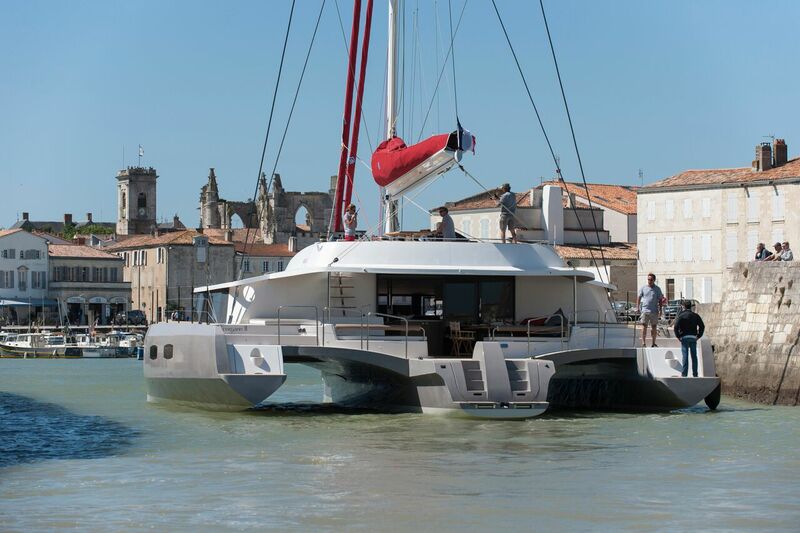 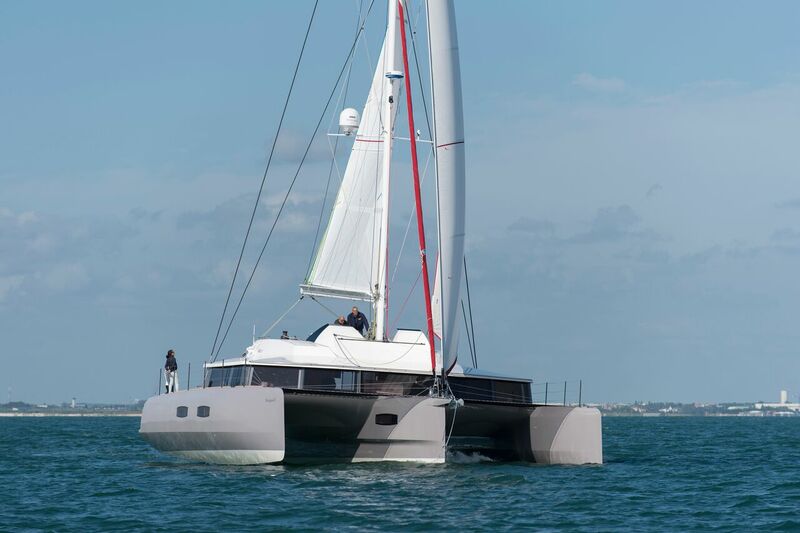 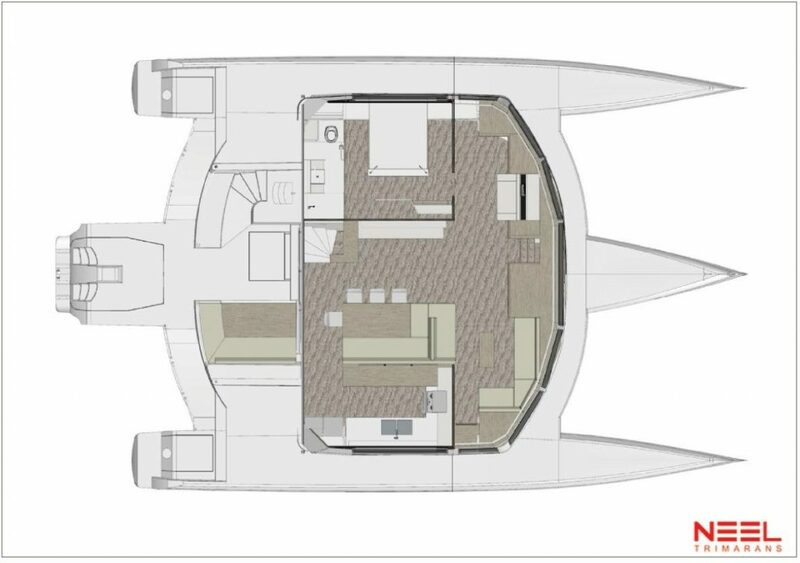 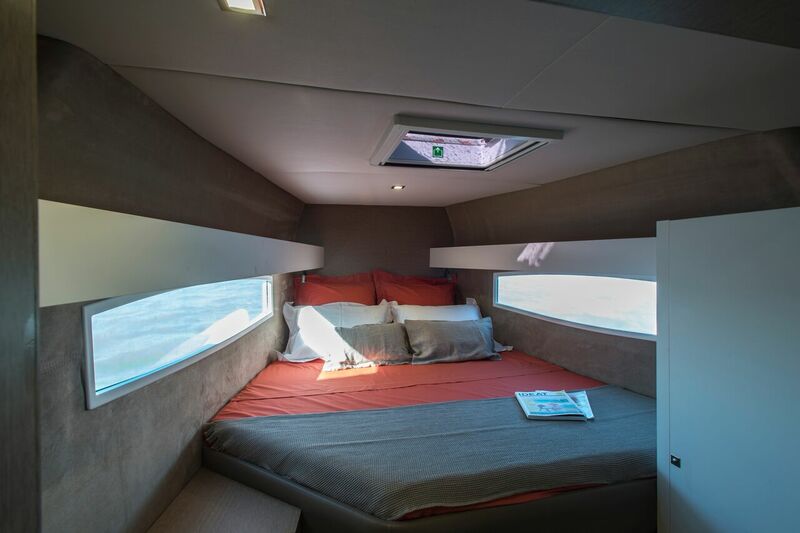 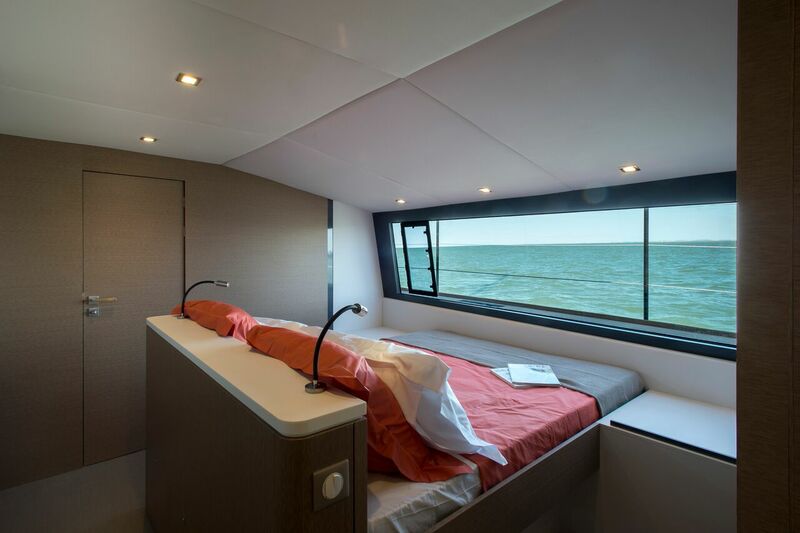 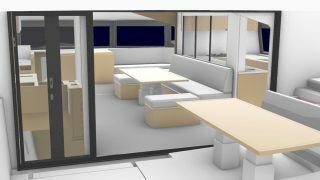 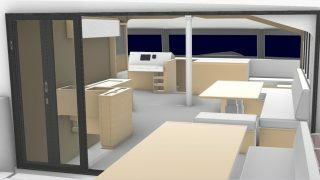 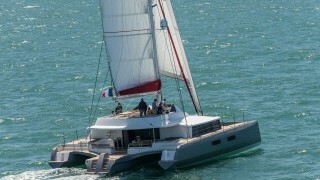 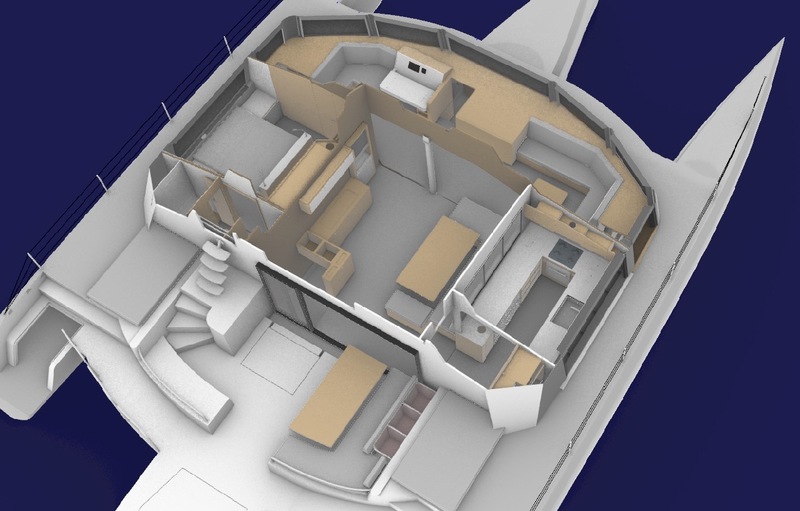 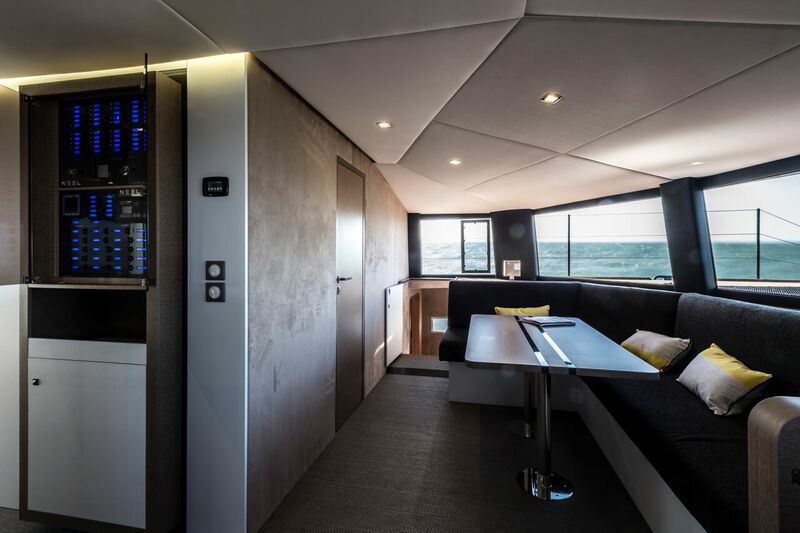 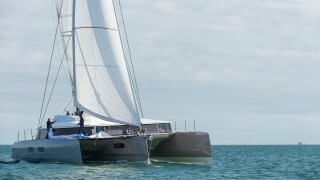 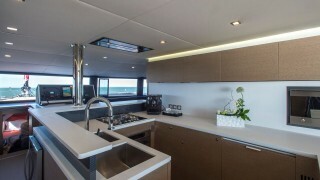 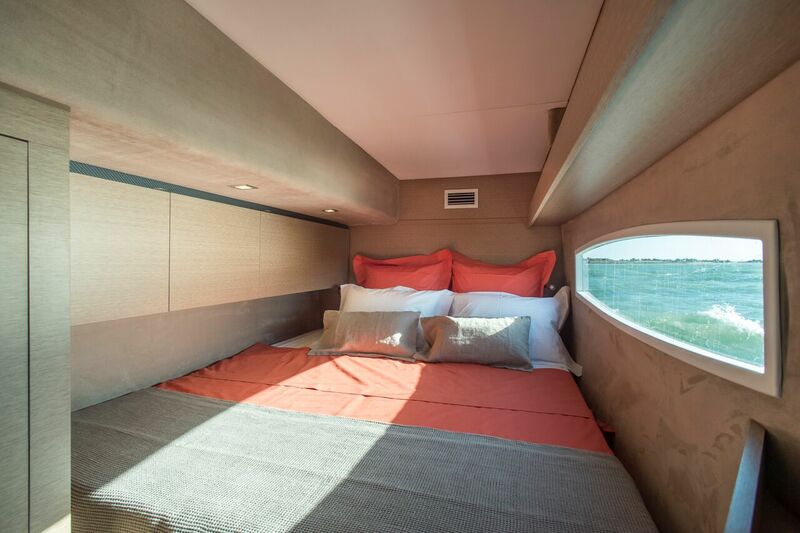 The main living area is on the same level as the cabins, allowing functional and fluid movement around the interior, which is unique for a cruising multihull. 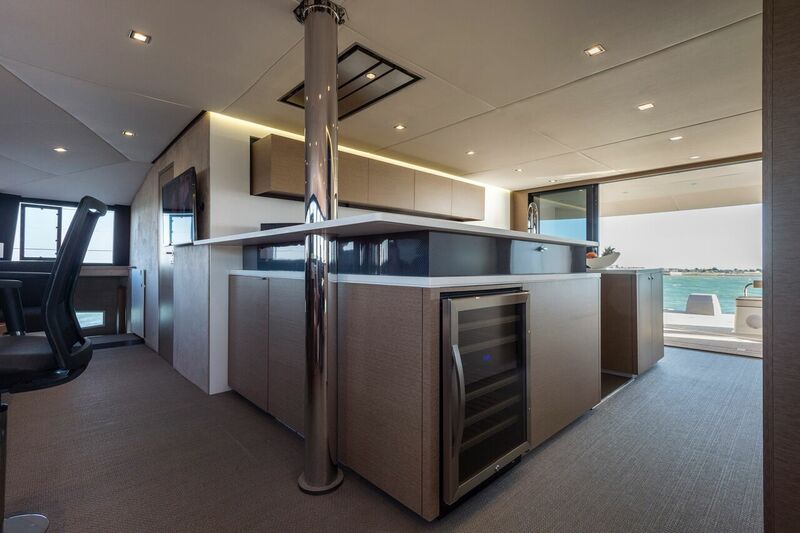 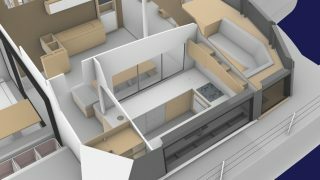 The central kitchen is equipped with a fabulous bar area that is ideal for entertaining.. 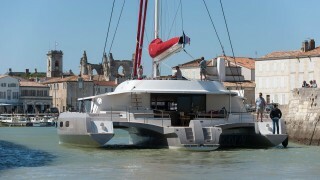 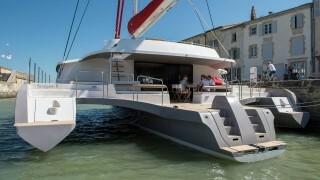 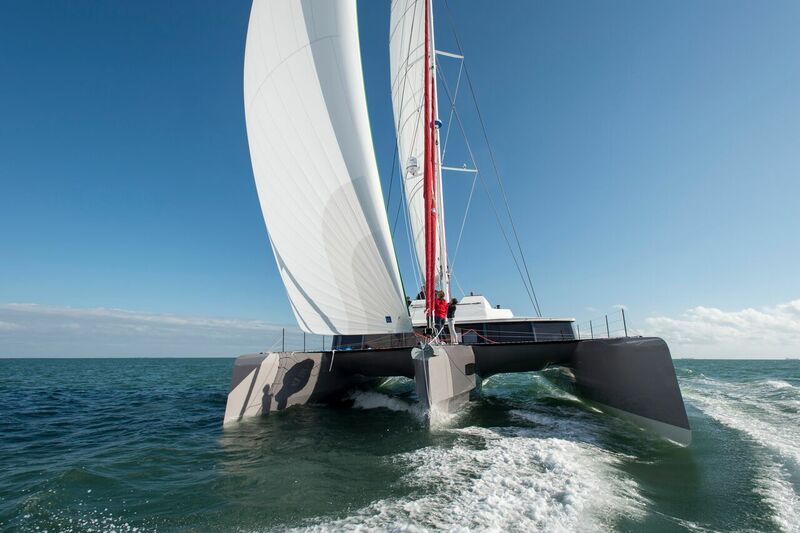 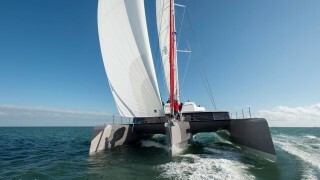 The trimaran’s two tables (one of which is convertible into a cocktail table) can host up to twelve guests. 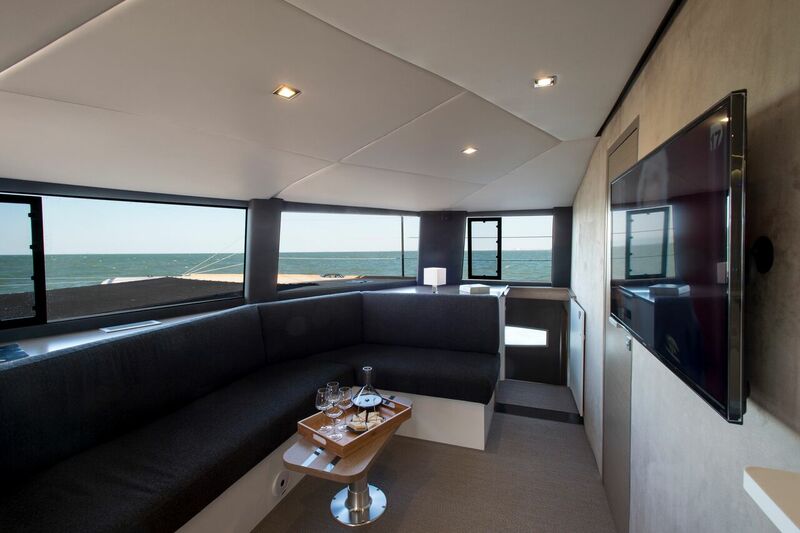 The two L-shaped sofas face each other in a highly comfortable volume. 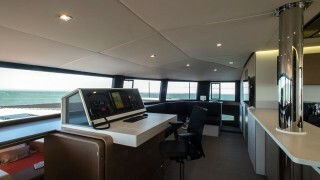 A large chart table is situated in the centre, looking out to sea with panoramic view of 220°. 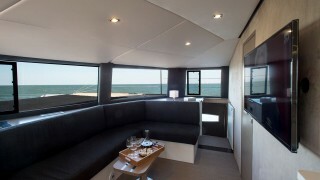 The owner’s suite is majestic, boasting a large double bed with a view of the horizon through a 2.5m wide bay window. 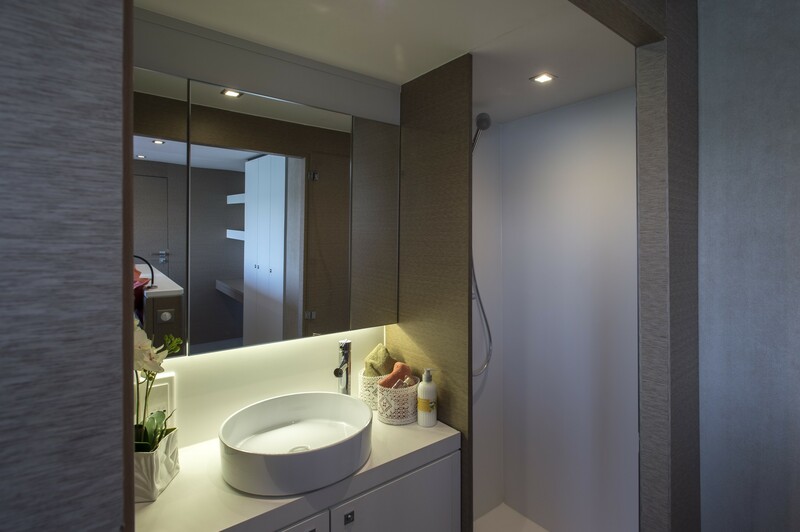 Light fills the space, inviting the outside world into its embrace. 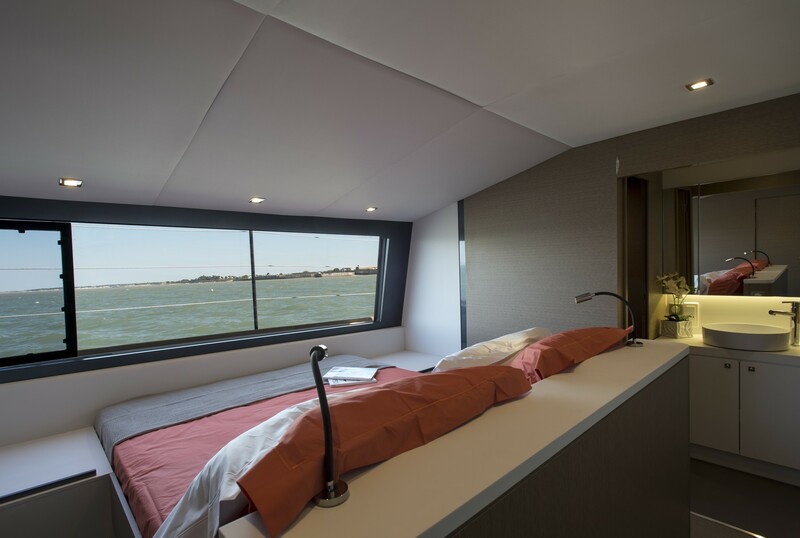 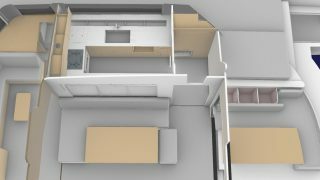 The cabin has a separate toilet and a bathroom with shower looking out to sea through a vertical panel. 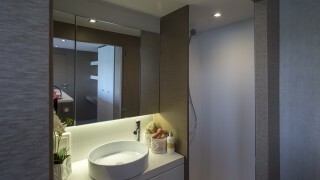 Each of the other cabins has its own private bathroom with toilet. 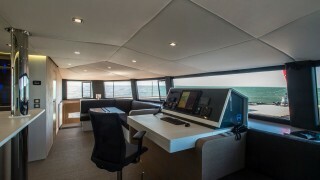 Access to the cockpit is through a wide sliding glass door. 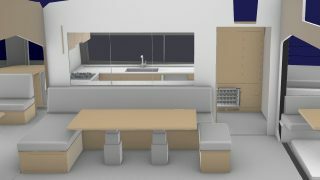 The large table accommodates 10 guests comfortably seated on a U-shaped bench. 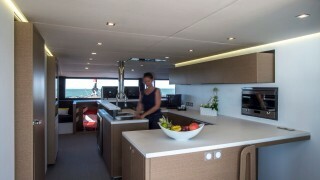 The cockpit has a kitchen with sink, fridge and hotplate, and there is a superb sunbathing area to starboard. 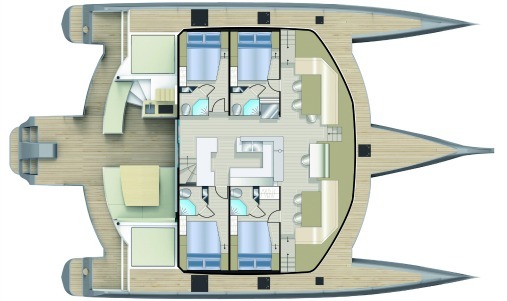 The skirt of the central hull platform offers a large 2.5m x 2m swimming deck equipped with a swim ladder. 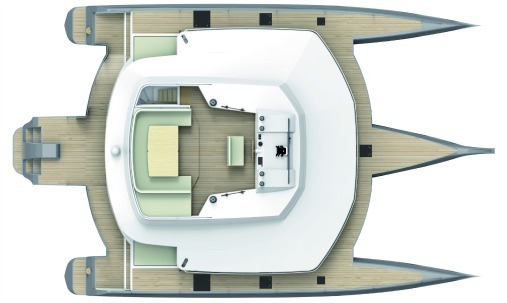 At the aft of the main hull is a space for storing the dinghy in order to protect it from inclement whether while sailing. 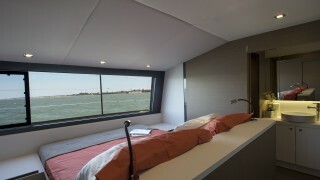 At the rear of the side floats are stowage bins for leisure facilities (canoes, windsurfing or paddle board gear) with quick and direct access to the sea by the skirts. 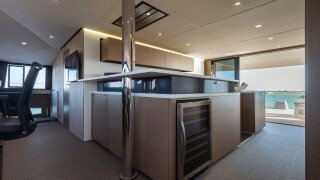 Access to the flybridge is via a staircase from the cockpit, providing extra security. 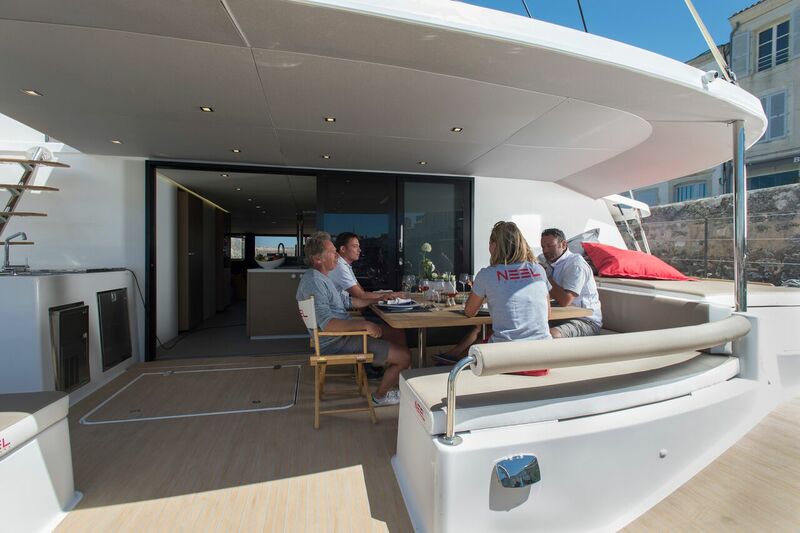 This communal area of 33m2 contains both the helm and a table for eight people with a bench convertible into a wide sunbathing zone. 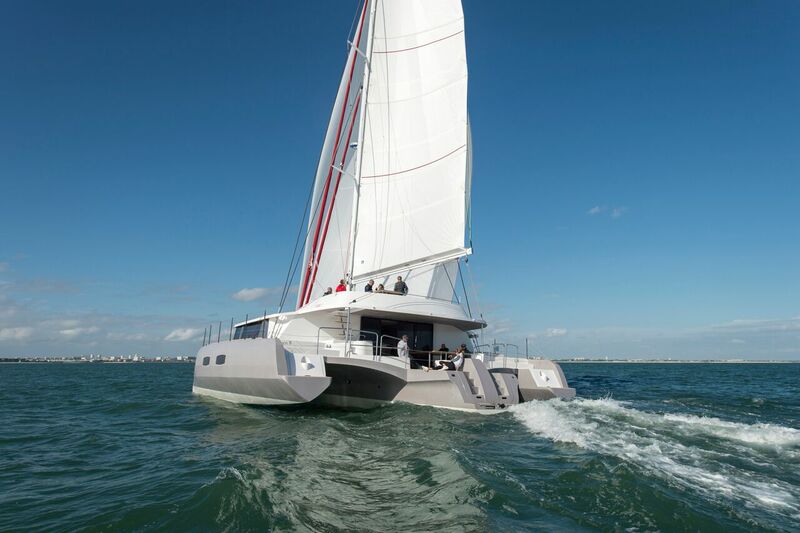 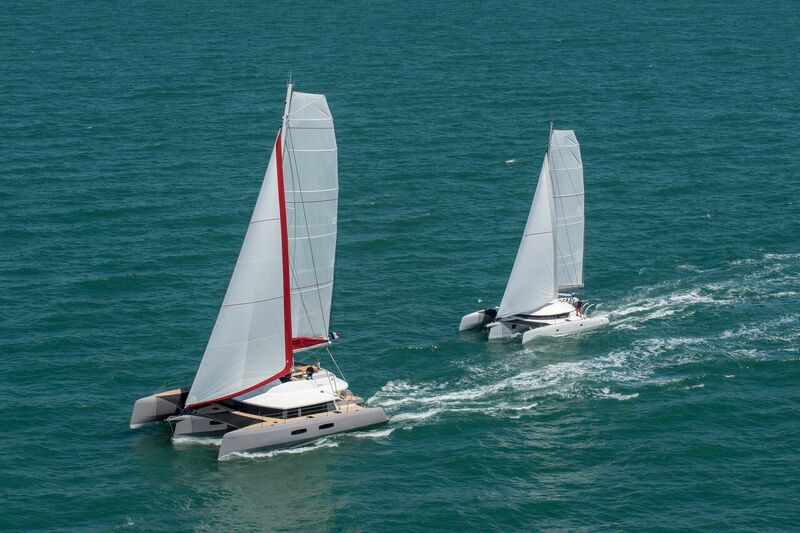 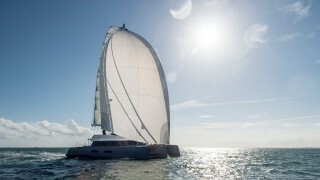 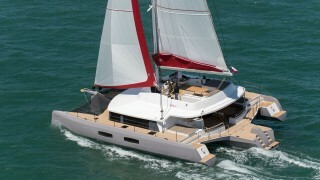 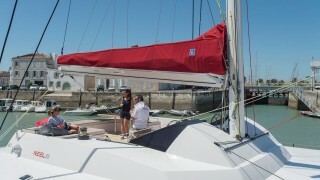 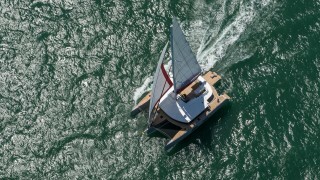 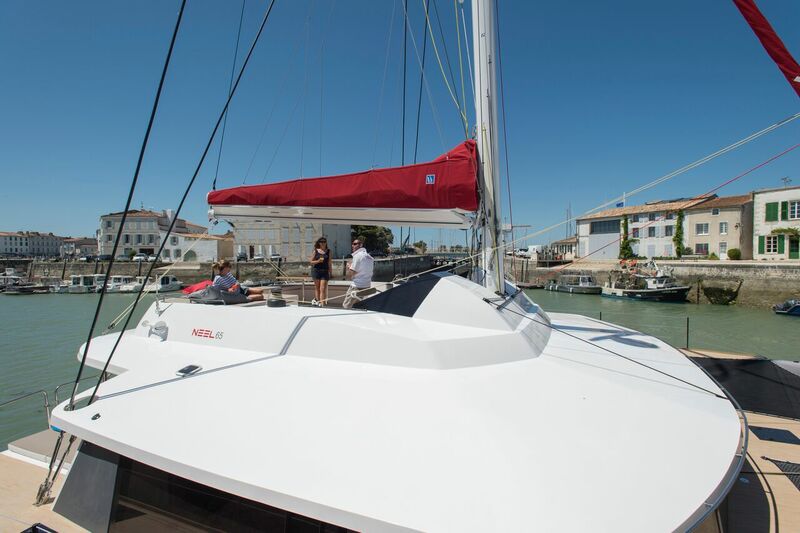 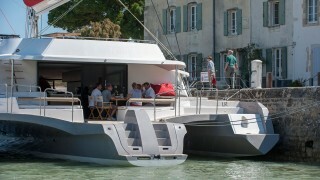 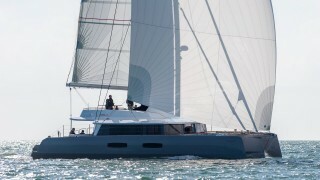 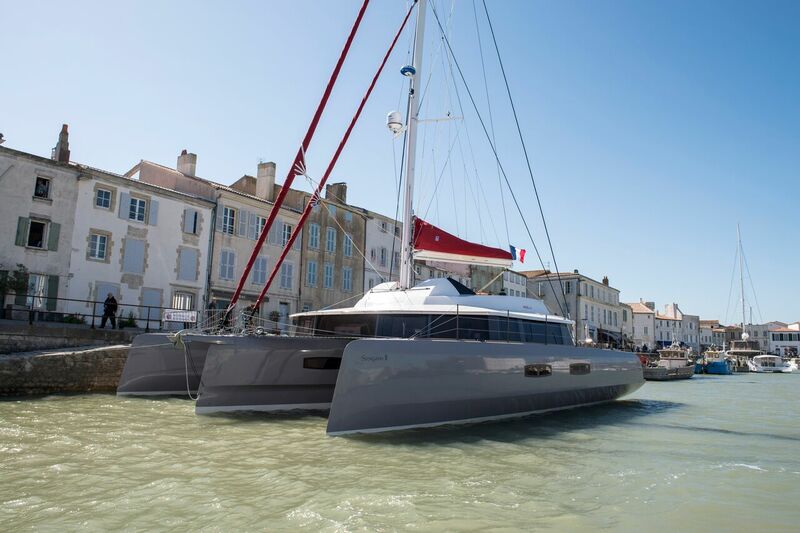 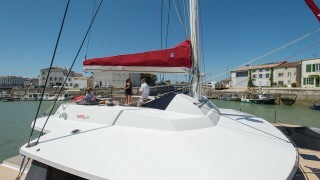 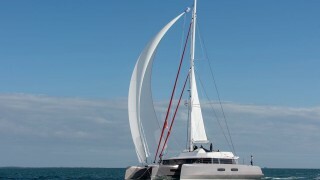 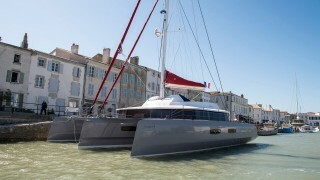 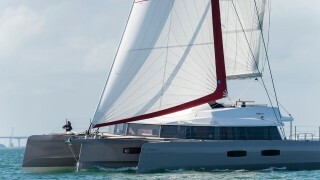 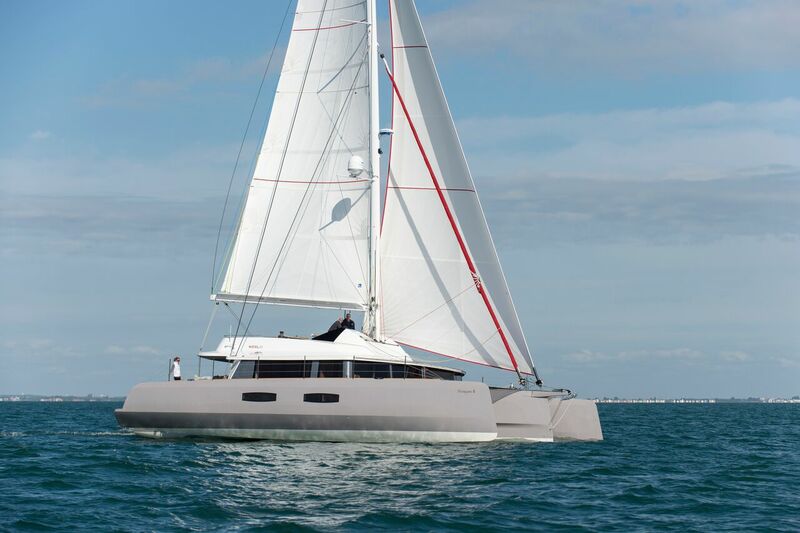 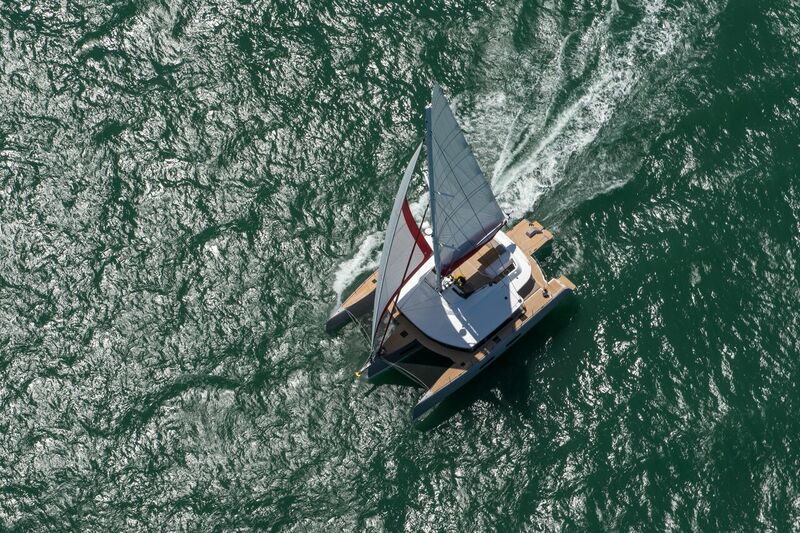 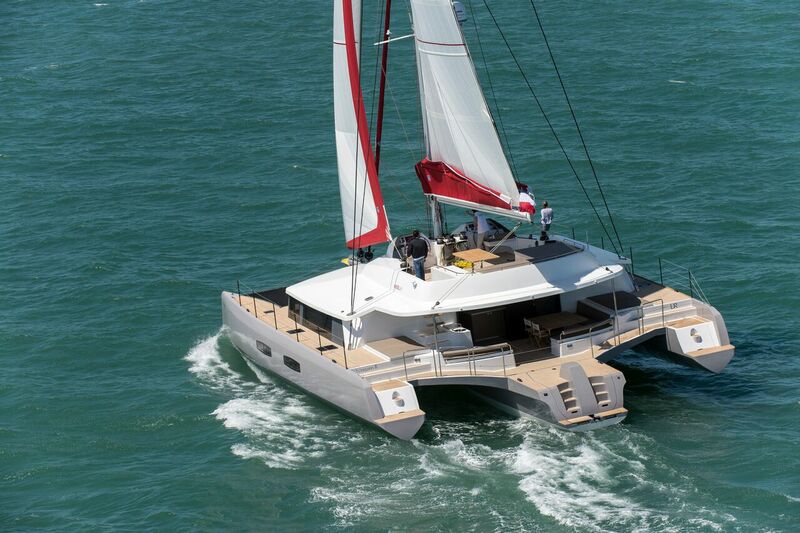 The helm groups all systems for manoeuvering and does not impede on the comfort of the guests. 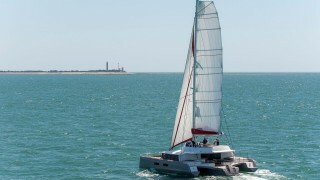 A “High Performance” option is also available with a net weight saving of 1.1 tonnes. 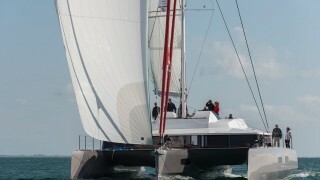 Carbon mast with rail and trolleys and harken ball races, carbon canoe boom, textile standing rigging , Dyneema running rigging, pulpit carbon helm wheel, mainsail, genoa and staysail in Hydranet (Spectra / Dacron) Genaker and gennaker fittings, winches Harken Performa, fixtures in composite core. 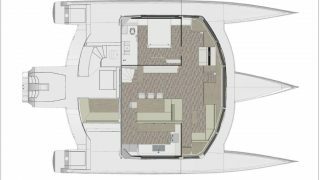 The NEEL 65 is very easy to operate, even with a reduced crew, thanks to deck equipment and electric winch control at the helm on the flybridge. 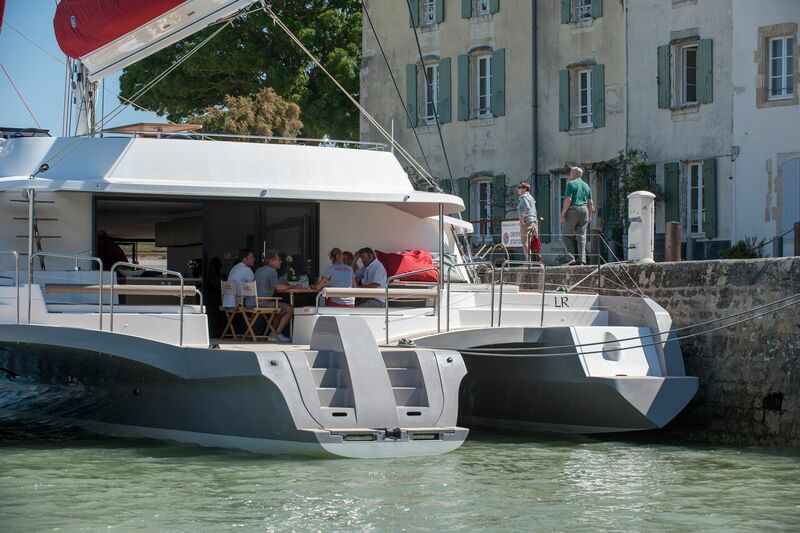 Remote control of the engine and bow thruster from the flybridge facilitates docking manoeuvres. 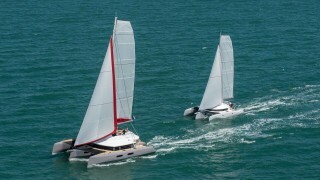 A “High Performance” option is available with a net weight saving of 1.1 tonnes. 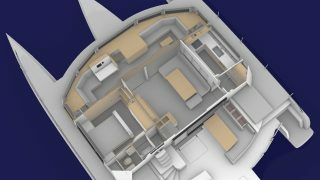 Saloon and berth cabins on a single level. 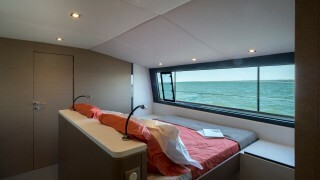 Not to mention the performance and comfort going out to sea!